The Funky Felter: Too Tiggerific not to share! Too Tiggerific not to share! I just had to share a photo of my precious baby girl that was taken on Christmas day. 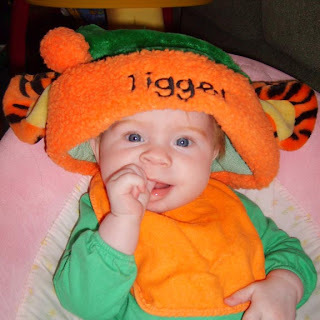 Okay, so I know that I'm biased, but I think she is quite adorable in her Tigger Christmas hat. She's absolutely adorable and I'm not even related to her!! Happy, healthy 2010 to all of you! Shalana--What a cutie she is!! Here's wishing you and your sweet family the most wonderful year ever. (This is easily realized, too, since I've always thought that little babies are the most fun between 6 and 12 months of age...it's like they 'get the joke', now, and everything is funny to them!) Enjoy!! I'm not the list bit bias and agree that she looks adorable...is she part elf ? She has such a mischievous little grin . You're right, it's too good not to share! She is darling and precious. Thank you for sharing her and you with us.